Bought as a gift for my daughter to go with the glass bowl that came with her mixer, it's nice to have the extra one when baking/mixing multiple recipes. Offers enough capacity to mix dough for 9 dozen cookies, 4 loaves of bread or 7 pounds of mashed potatoes in a single batch. The bowl is also dishwasher-safe for quick and easy cleanup. Fits models KSM150PS, KSM152PS and KSM155GB. I bought this to replace the glass bowl that came with my newest KitchenAid mixer a couple of years ago. I have owned 3 KitchenAid mixers and thought the glass bowl would be nice. WRONG ! It was sooo heavy and did not fix good on the mixer so I replaced it with this bowl like my other mixers have. These are the best bowls with the lightweight stainless steel and perfect placement of the handle. If you have a bowl with the handle replace it with this one. You won't be sorry ! Genuine KitchenAid stainless bowl at a great price! Well-packaged and arrived in perfect condition. Solidly built. Handle attached extremely well. Works perfectly with my KA Artisan Stand Mixer and all related attachments. I deliberately bought this bowl as an addition to the one which originally came with the KA mixer as many recipes call for creating mixtures in "separate bowls". This takes care of that, and now I can quickly switch-out the bowls as needed saving me tons of time! I couldn't ask for more . . . Thanks O.co! 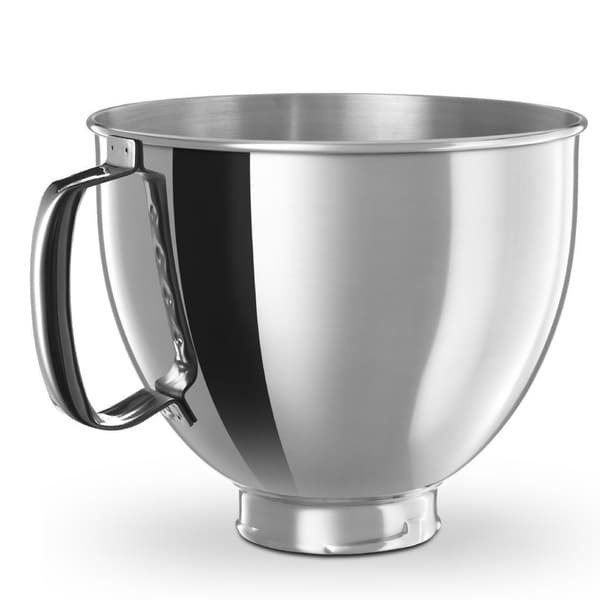 This bowl looked identical to the one that came with my Artisan 5 qt mixer-- including the item number on the bottom of the bowl-- but once I turned on my mixer, I quickly discovered that it was not manufactured correctly. The grooves around the bottom rim of the bowl that are supposed to hold it in place were too shallow, almost as if the mold for the grooves was not pressed in close enough. The bowl began to spin and fell off of the mixer as soon as I turned the mixer on. I'm guessing this was just a bad batch, but I asked for a refund instead of a replacement because I'm guessing this was not the only bowl that was malformed in this batch. I already own a KitchenAid Artisan Standing mixer and lately I've needed a second bowl for recipes. This bowl is an exact match for my first one. I am so glad I found it. It also came with a plastic cover for storage, which I like. Thank you so much and your response and shipping was very speedy. Love this light weight bowl. Perfect and easy to handle. They have so many versions of kitchenaid mixers it hard to decide on the accessories. I wanted a cover, a spout cover and an steel bowl. The bowl fits perfectly on my Artisian mixer. I was concerned about the fit because I had a problem with the glass bowl that came with the mixer. It actually fits better than the glass bowl so I am pleased. Love having an extra bowl for my mixer. Excellent [lighter weight] bowl to accompany the [heavier weight] glass bowl which came with the ab fab mixer. KitchenAid never fails to deliver the goods, and it never hurts to have a spare. ld't hove this size and will make my holiday baking go more smoothly, if I don't need to stop to wash the bowl between batters. It does what is suppose to. I purchased this as a an extra and very happy I did. 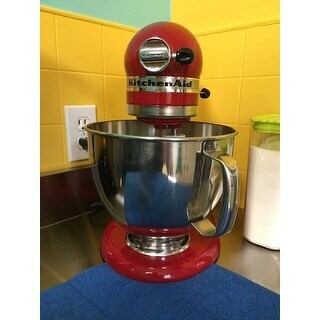 Comes in handy all the time, fits perfectly and of course is a quality KitchenAid product at Overstock prices. I loving the product I recommend this product to my friend. Fit perfectly! Mother in law loves it to go along with her glass mixer bowl! Her previous glass bowl broke on the bottom fitting so I ordered her this for Christmas. It was well needed with all the cooking and baking! Made it to me in time for gifting and baking! "I have a ksm154gbq2p kitchenaide 5 qt artisan mixer . I have a glass bowl and want to get a lighter stainless bowl. Would this work. Doesn't have my model listed"
While I would like to give you a definite yes, keep in mind that it seems that others have had problems with this bowl fitting their model. I however, did not. The bowl fit my mixer perfectly (my model no: KSM150PSER1), and my mixer initially came with a glass bowl too. I am under the impression that this bowl fits a few models . . . so If your 5-Qt, Artisan looks like mine with the bowl attaching to the base (my review on Overstock includes a photo / user name: outdesigns), then you should be good to go. If your mixer is the model with a "lift bowl" which does NOT attach to the base, then I would definitely stay away. I too wish KitchenAid made replacement parts less confusing . . . I hope this helps. Yes, it is compatible. I hope it helps. "Can this bowl be used with a Hamilton Beach stand mixer?" I do not believe so. The bottom of the bowl has a special rim that locks into place on the KitchenAid. Hope this helps! "Is this product "made in USA"?" The bowl was made in the United States. Lighter in weight than the glass bowl, plus it doesn't hurt to have a spare around.